When it comes to finding a job, few workers have greater difficulty than high school dropouts. A report released last week by the Georgetown University Center on Education and the Workforce reaffirms that those with more education have an easier time finding work than those with less. While the unemployment rate for four-year college graduates stands at about 4.5 percent, joblessness among those with only a high school diploma is nearly six times that -- 24 percent, according to the report, "The College Advantage: Weathering the Economic Storm" (via U.S. News & World Report). Still, for many workers the ability to complete a high school education remains elusive, even as their need to bring home a paycheck is paramount. With that mind, AOL Jobs, with the help of PayScale and Bureau of Labor Statistics data, has compiled a list of nine jobs for which it's possible to find employment without a high school diploma. As PayScale notes, however, though it's possible to land one of these jobs without a high school degree, the odds will be stacked against you. Much of your success will depend upon your skill and ability, whom you know, and working your way up the ladder. You'll also note that these jobs are in similar fields. Georgetown University's research shows the majority (60 percent) of the jobs that will soon become available to high school dropouts will be in just four sectors -- three of which are dominated by men: transportation, distribution and logistics; architecture and construction; and manufacturing. The remaining sector, hospitality and tourism, is dominated by women. With these limitations in mind, here are some good-paying jobs for which a high-school dropout may be eligible. Automotive service technicians and mechanics, often called service technicians or service techs, inspect, maintain, and repair cars and light trucks. The job frequently involves working with high-tech components, such as computers and electronics, but also involves greasy parts and tools. Some employers may require applicants to have some formal post-secondary education and the need for certification is growing. The Bureau of Labor Statistics forecasts average job growth of about 17 percent. **Percentage of those employed in this job with a high-school diploma (45 percent) or less (19 percent). 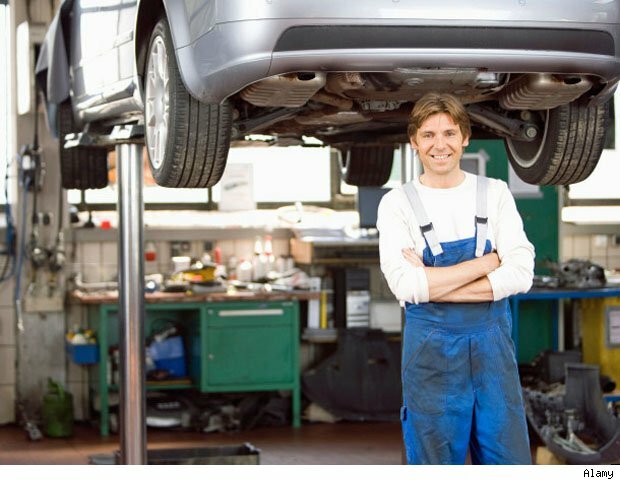 Looking for a job as an automotive service technician? Click here to get started. All of these professions involve joining metal parts and doing finishing work, including filling holes or seams in metal products using handheld tools. These jobs may involve working in confined spaces indoors, or in inclement weather or on scaffolding outdoors. Heavy lifting may also be required. Training for the job varies from a few weeks of school to -- for more specialized jobs -- several years of combined schooling and on-the-job training. Overall job growth through 2020 is forecast at 15 percent. Percentage of those employed in this job with a high-school diploma (50 percent) or less (23 percent). Looking for a job as a welder? Click here to get started. Carpenters perform a wide variety of construction-related jobs, including building stairways, door frames, rafters and other products made from wood and other materials. They also may install kitchen cabinets, siding and drywall. It can be dirty and tedious work, and may involve working in all kinds of weather -- from broiling heat to bitter cold -- depending on project deadlines. Most carpenters learn the trade through a formal apprenticeship, though some start as helpers and learn as they go. Despite the ongoing slump in construction, generally, the need for carpenters is expected to grow 20 percent through 2020 -- faster than the average for all occupations. Percentage of those employed in this job with a high-school diploma (44 percent) or less (25 percent). Looking for a job as a carpenter? Click here to get started. This job typically involves operating heavy machinery used in the construction of roads, bridges, buildings and other structures. It can be challenging work in part because heavy-equipment operators work in most any weather. A full-time job, it can also involve working odd hours, since some construction projects, especially road building, are done at night. Job growth at 23 percent through 2020, is faster than the average for all occupations. Percentage of those employed in this job with a high-school diploma (52 percent) or less (25 percent). Looking for a job as an heavy equipment operator? Click here to get started. Though hybrid vehicles have caught the attention of many drivers seeking higher fuel economy, diesel engines are becoming more popular among car buyers -- and at some point they will require repair. Add to those the nation's fleet of 10 million diesel delivery and over-the-road trucks (not to mention buses) and you get a pretty good idea why forecasts call for job growth of about 15 percent through 2020 -- about average. As with any mechanic's job, it can be dirty work and overtime may be required. Also, employers increasingly prefer applicants to have completed a post-secondary training program. Percentage of those employed in this job with a high-school diploma (49 percent) or less (16 percent). Looking for a job as a diesel mechanic? Click here to get started. This job typically involves moving goods from one destination to another and may mean covering a wide variety of terrain, from bustling city streets to miles of wide-open highway. A commercial driver's license is required, and it's not uncommon for employers to stipulate that applicants have at least two years of experience. Downsides may include spending long hours alone, as well as days and weeks away from home. BLS forecasts call for higher-than-average employment growth among truck drivers through the end of the decade. Percentage of those employed in this job with a high-school diploma (50 percent) or less (20 percent). Looking for a job as an heavy-truck driver? Click here to get started. Executive assistants typically have some formal education, though requirements to do the job -- office, computer and organizational skills -- don't necessarily mean those with lesser education don't have a shot of landing the job. Within the general secretarial field, forecasts call for demand to increase 12 percent through 2020, about average among all professions. Percentage of those employed in this job with a high-school diploma (31 percent) or less (2 percent). Looking for a job as an executive assistant? Click here to get started. Restaurant managers, also known, as food-service managers, are responsible for the daily operations of restaurants and other establishments that prepare and serve food and beverages. Though relatively well-paid, restaurant managers are known to log long hours, including weekends and many holidays. Percentage of those employed in this job with a high-school diploma (30 percent) or less (10 percent). Looking for a job as a restaurant manager? Click here to get started. *Median annual pay is based on PayScale's surveys of workers with 5 to 8 years of experience on the job, and includes all forms of compensation. "Median" means half of all workers in a given occupation earned less, while half earned more. **Percentage of workers who are either high school dropouts or have only a high school diploma is as published in "Career Clusters: Forecasting Demand for High School Through College Jobs, 2008–2018," by the Georgetown University Center on Education and the Workforce. Another Disappearing Blue Collar Job?